Learning to ask good questions is a Christlike thing to do. Here’s a discussion about the questions God asked Hagar. These questions form the basis of my pastoral counseling ministry. Recorded at ICA, Phnom Penh Cambodia, November 2017. Click here to listen to the mp3, or find this message on the trotters41 podcast here. Sometimes you stumble across a tool that you didn’t know you needed, but as it turns out, you really do. Like pretty much everything Steve Jobs ever created. I’ve creatively titled this tool “The Shapes Diagram.” I use it with 90% of my pastoral counseling clients because it takes complex ideas (like emotions and inner healing) and makes them a bit more concrete. This diagram basically designed itself as I was trying to communicate some core emotional health ideas to Cambodians in Khmer. It wasn’t that my clients were dumb, it was that I lacked enough language skill to accurately describe some things. I’ll walk you through the thing here in a minute. But if you’d rather watch an 11-minute video of me explaining The Shapes Diagram, click the video below. Basically, we all have emotions, and most people end up seeing me because they’re having some emotions they don’t like. In other words, most people don’t come in happy (except the pre-marital clients, they do come in happy, and usually they leave happy too, but that’s not a given). We start in the middle rectangle. For many, the rectangle (emotion) is anger or sadness or anxiety. Now, many pastors hear the story that led to the unwanted emotion and immediately start looking at what STEPS the person needs to take (or avoid) in order to get to the positive result (and avoid the negative one). Here’s the thing: that might all be good advice, and maybe people need to hear it, but pretty much every depressed person I’ve ever talked to already KNOWS those things. What I’ve come to believe (and experience with my clients) is that for the most part, all of that top part (the middle emotion box) and the steps and the results are all future-oriented things. That is, they force the client to ask, “What will I do now?” And that’s certainly a very valid question. The thing is, that top half of the diagram (Emotions plus Steps plus Results), often balances precariously on the triangle that consists of emotional pain and lies from the past. It takes a lot of energy to keep everything steady on the tip of that triangle, but people try. And they try and they try. And they never deal with the emotional pain and the lies. We do them a tremendous disservice if all we do is give them Steps. I want to ask the question, “What’s in the triangle? What’s the pain that this is all balancing on?” In practice, about half of my clients see this diagram and immediately say, “Oh, I know what’s in that triangle!” They then go on to list the traumatic event or the emotional trauma and the lies it planted. The other half typically says, “Well, I think this is probably true, but I’m not sure what’s in there.” That’s fine too, and so with their permission, we just continue the conversation. Then, with the triangle gone, the client’s emotions are simply resting on the Truth (Jesus). The emotions are still there, because the client is still a human, but the whole thing is much more stable. Now some people try to bypass the triangle and jump straight to the Truth. But that’s not as effective. In fact, it’s just terrible. You can’t skip the triangle and jump straight to Jesus. You want to meet Jesus in the triangle. And he wants to meet you (and your clients) there too. If you jump over the triangle (the pain/lies) you also jump over the healing. I ask people to imagine that someone’s drowning in the middle of the Mekong. What if I see them drowning and I ride my boat over to them and I give them five gallons of good, clean water. Do they need that water? Well, sort of. I mean, people need clean water to drink. And the Mekong is filthy. But is it helpful to them? No. It’s also not very kind. When someone’s drowning, I don’t want to just throw clean water at them, I want to actually help them. We do that to folks who are depressed or anxious or experiencing a lot of difficult emotions. We give them good clean “water” of Truth and throw a Bible verse at them and stuff. The verses are true and good, but the timing is way off. Help the person NOT drown. That’s what the Church has to get better at doing, not just throwing water bottles to drowning/depressed people and telling ourselves we were helpful. One article that might prove an additional resource is something I wrote about the Psalms. You can find that article here: The Gaping Hole in the Modern Missions Movement. Caveat: I’m all for medication if it’s necessary, and I would NEVER tell someone who’s depressed to stop their meds or go off their meds. I’m talking about a holistic approach here. So maybe someone’s on meds, fine, they should still be looking at what might be in the triangle. Maybe there’s nothing, but maybe there’s something. Maybe it really is just a chemical imbalance that needs intervention. I believe that happens. But I also think exploring past painful events and asking around for deep-seated lies can expose someone to healing and greater self-awareness. Let’s talk about the difference between lie-based pain and fact-based pain (the stuff in the triangle), and why the distinction matters. I was at a Lenten prayer service last year when he said, “Let us become present to the Lord, for He is always present to us.” I knew what he was saying was true, for I’d learned it in other areas of my life (Psalm 139 anyone?). So what he said was more a vocabulary lesson than a course correction. God is always present and available to us, and I can no longer say with integrity that we “enter the Lord’s presence” during a worship service. In fact, now when I hear that phrase from others, I start to tune out. What I can say with integrity is that we can choose to become present to the Lord. So with that in mind, here’s everything I know about becoming present to the Lord. In other words, here’s everything I know about spiritual formation (so far). 1. Regular, private devotional times with God. Don’t feel guilty about skipping times. 2. Meeting with other believers for corporate worship. The Church has been key to my spiritual growth. I go into a worship service expecting God to speak to me through songs, sermons, and prayers. And He does. I cannot downplay the importance of the Church in my spiritual life; neither can I downplay the importance of my private devotional life. I need both. 3. Small group Bible studies and other intimate forms of community. I’ve talked about this before, but for years in the States I was part of a small ladies’ Bible study. I learned so much about life and faith from those (mostly older) women. They empathized with my struggles and prayed me through some of my darkest days. Most of what I know about Grace, I learned with them. Sometimes personal devotionals, corporate worship, and talking with trusted people are enough to work through my issues; sometimes they are not. I’ve had several key breakthroughs in my life because of counselors (both licensed professional counselors and pastoral counselors), and I cannot overstate the importance of sometimes getting outside help. I would not be where I am today in my relationship with God and my relationship with others without the help and intervention of those counselors. Well there you have it, everything I know about spiritual formation (so far). What would you add to my list? We were in a diner eating pizza. The young couple sitting across the table from us had just asked us how we’ve sustained the joy of our relationship over the years. I wasn’t exactly expecting that question, so my first answer was pretty simple: we spend a lot of time together. Talking, dreaming, laughing, debriefing. Companionship and intimacy require time, and lots of it. When we were first married, we retreated together to cheap lawn chairs overlooking bushes that barely shielded us from the highway on the other side. We walked all over that university town, in all kinds of weather, for our date nights. We might walk to the library for a free movie and share an order of breadsticks from Papa John’s, where even with the sauces, our meal totaled a mere $3.69. Later we added children, and enough disposable income for Jonathan to buy me a porch swing. We’d sit in that thing and talk while our children played. At night, we’d tuck them into bed and sneak back out to talk some more, with hot chocolate or bug spray as our companions, depending on the weather. 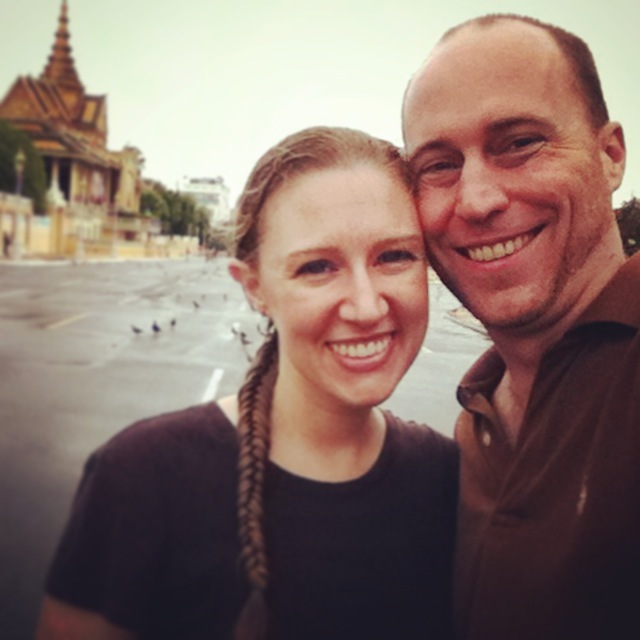 Even after losing both the yard and the porch swing in our move to Cambodia, we found a way to escape together. We’d head up to our roof and sit in bamboo chairs (with bug spray as our definite companion), watch the city skyline, and share soul secrets. These days you’d be more likely to find us sipping coffee at our kitchen table, the kitchen door conveniently locked behind us. 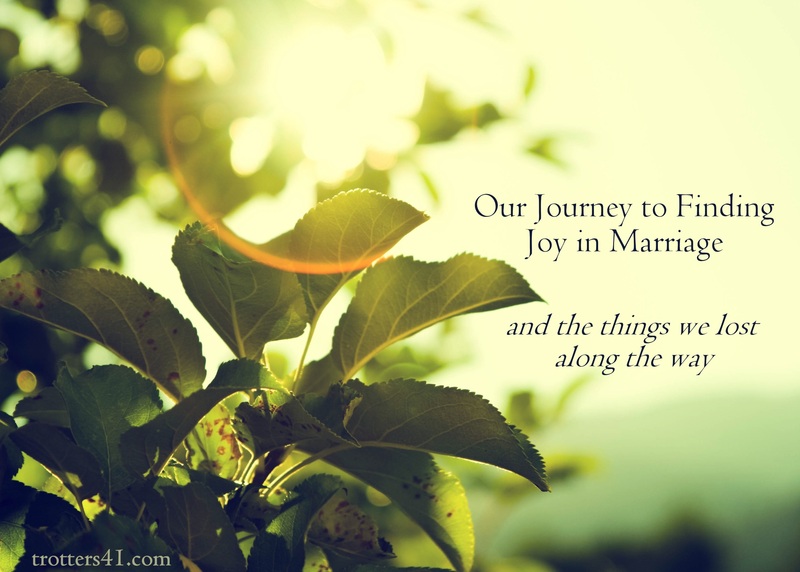 But the more I pondered this young couple’s question about joy in marriage, and the more I traced our marital history over the years, the more I realized that finding joy was about losing things too. On the journey to find joy in marriage, we’ve shed some surprising baggage. I went into marriage spouting ideals of male headship. My husband Jonathan would be in charge and make the final decisions, and I, as the wife, would submit. In any disagreement, his opinion would count for more. We thought we believed that premise, and because we didn’t have a lot of conflict, we thought we were pretty good at following it. In real life, however, I don’t think we ever actually practiced male headship (or what is sometimes called complementarianism, a term I didn’t know at the time). We thought we did, because we loved God and wanted to obey His Word. And male headship is what the Bible instructs, right?? But Jonathan never pulled the “I’m in charge” card on me. Never. Not even once. Not even when he felt led overseas and I didn’t. I put pressure on myself to submit to his call, but it never came from him. Growing up, I watched my mom honoring her husband, and she taught me to do the same. When it came to practical advice, though, she focused on “talking things out.” She told me that in her marriage to my dad, if one of them cared about something more — whoever it was — they went with that. The next time it might be different, and that was ok, because nobody was keeping track. She said if they didn’t agree, they just kept talking until they did agree. Practically speaking, my mom and dad were on equal terms in their marriage. One day my mom told me about a conversation with some other Army wives. One of the women turned to my mom and told her that she must really love her husband. Mom was a bit confused; she hadn’t been raving about how wonderful Dad was or how much she loved him. But something in the way she talked about him (or not talked about him, as the case may have been) spoke her love loud and clear to those fellow Army wives. Now I know that the type of marriage my mom was describing follows the mutual submission outlined in Ephesians 5:21: Submit to one another out of reverence for Christ. Now I know that people call this type of relationship “egalitarian.” But it’s almost as if back then, we had no vocabulary for the Biblical marriage conversation. Even in the early days of our marriage, whenever we needed to make a big decision, Jonathan and I would always pray together. We assumed that God would impress the same thing on our hearts, and that we would be united in both seeking God and obeying Him. 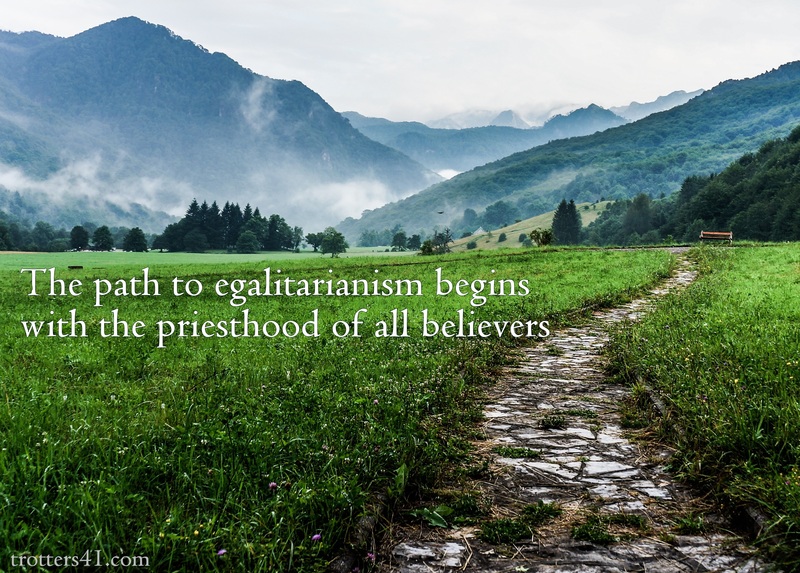 Looking back now, I can see that the path to egalitarianism begins with the priesthood of all believers. We went into marriage saying we believed in male headship, yet in decision-making, we fully expected God to speak to both of us. We believed we could, and would, both hear from God, and that God would say the same thing to both of us. Blame it on the Experiencing God craze of the 1990’s if you want, but this is how we approached God from the very beginning of our marriage. Then I read the book (which is a long one for being built on the foundation of only one verse). About halfway through, I had to put it down. It was so tedious I couldn’t finish it. How many more stories and examples could there be?? The book seemed to be repeating itself. Besides, I felt like something was missing. I need my thoughts, ideas, and intellect valued: I need respect. Almost as much as love. And my husband needs love, perhaps more than respect. He can’t survive without my compassion, empathy, and listening ears. Lest you get the wrong idea here, let me make one thing clear: I deeply respect my husband. I value his opinions and consult him on everything. I turn to him for counsel, guidance, and perspective. I trust his advice and regularly defer to him in decision-making. He most certainly has my respect. 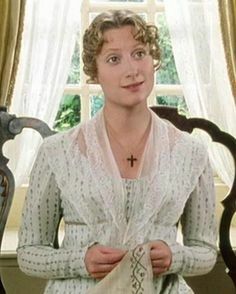 But for him, although my respect is nice, if I did not also care about his feelings, his dreams, and his deepest longings, and if I did not tenderly take care of him, he would shrivel up and die (his words, not mine). He needs my open-hearted love. And if he loved and cared for my deepest hurts and feelings, but did not also value my gifts and abilities, I’d be crushed. In fact, if I didn’t have his respect, I wouldn’t actually feel loved by him. Receiving only love or only respect isn’t good enough for Jonathan and me. We need both love and respect. The teaching of “Love and Respect” was a nice start, but for us, it didn’t go far enough. As a wife, yes, I respect my husband, and as a husband, yes, Jonathan loves his wife. It’s in the Bible; it’s good. But God isn’t going to be offended if wives also love their husbands, and husbands also respect their wives. In the book of Ephesians, Paul was improving upon the pagan hierarchies of the day. Neither Paul nor Jesus – who demonstrated both love and respect for women repeatedly in the Gospels – is going to be upset if we take these instructions that much further, if we add more love and respect, and more imago dei, to our relationships. On the contrary, I think it pleases Him. The more I considered this young couple’s question, the more I kept coming back to the same answer: emotional healing. Emotional healing is what happens when Jesus walks into our pain and binds up the wounds of our hearts. Emotional healing is what draws us closer to each other than ever before. It’s what enables us to answer Karen Carpenter’s velvet-voiced, pain-tinged question: “Why do we go on hurting each other, making each other cry, hurting each other, without ever knowing why?” Emotional healing shows us both why we hurt each other and also, how to stop hurting each other. Pursuing emotional wholeness is a journey Jonathan and I have been on for four years now. And though we walk together, our paths look different. The healing Jonathan needed came in the form of expressing long-hidden grief. For me, it meant beginning to feel long-hidden feelings. 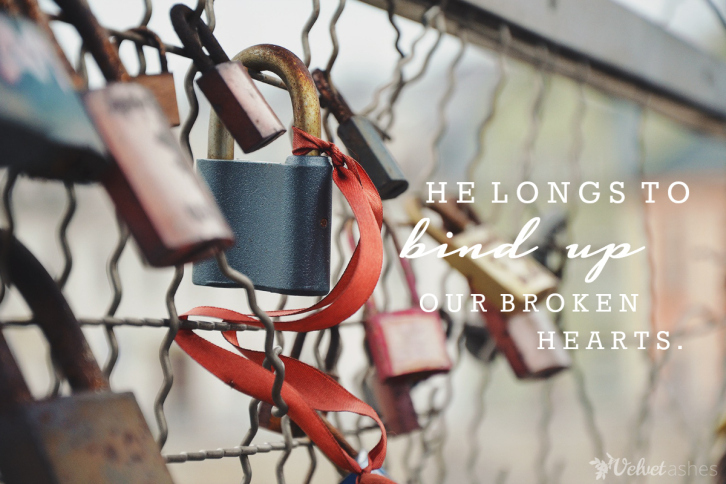 For both of us, the path to healing has trodden straight through pain, but it’s been worth it, for the healing we’ve found has deepened our intimacy and intensified our joy. Perhaps the honeymoon should have worn off by now, but it hasn’t. 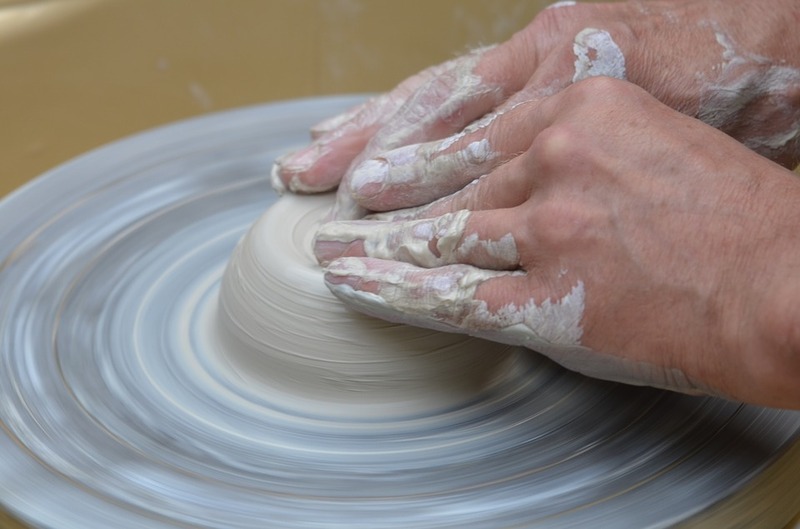 We have more joy and intimacy after 15 years of the “daily grind” than we ever dreamed possible. Along the way, we’ve shed strict interpretations of gender roles and lost deep emotional wounds. In their place, we’ve welcomed emotional healing and embraced mutual love and respect. We are co-heirs with Christ and co-leaders in our home. We lead each other closer to Jesus, closer to love, closer to wholeness. We give each other space to grow, and we say the hard truth to each other, too. This is what our Joy looks like. Today I’m over at Velvet Ashes, sharing a story of emotional healing. In case you haven’t heard of Velvet Ashes, it’s a website that provides encouragement, inspiration, and online community for women serving overseas, and it has blessed me tremendously in the last year. Before my husband and I moved overseas, we met with a pastor who specializes in counseling ministers and overseas workers. At the very first session, he launched into ideas like pain, connection, and empathy. I was both unfamiliar and uncomfortable with much of the emotional language he spoke, but I was too embarrassed to admit I didn’t know what in the world he was talking about. So I just sat there, nodding my head silently. I believe if a missionary family is happy and healthy, they will be more sustainable in the long-term. I also believe that the key to happy and healthy missionaries is preparation. One of the things I’ve learned these past two years is that there is a lot of heartache among cross-cultural workers. After a while, I noticed that often, people’s heartache had common characteristics, and could have been addressed before arriving on the field.